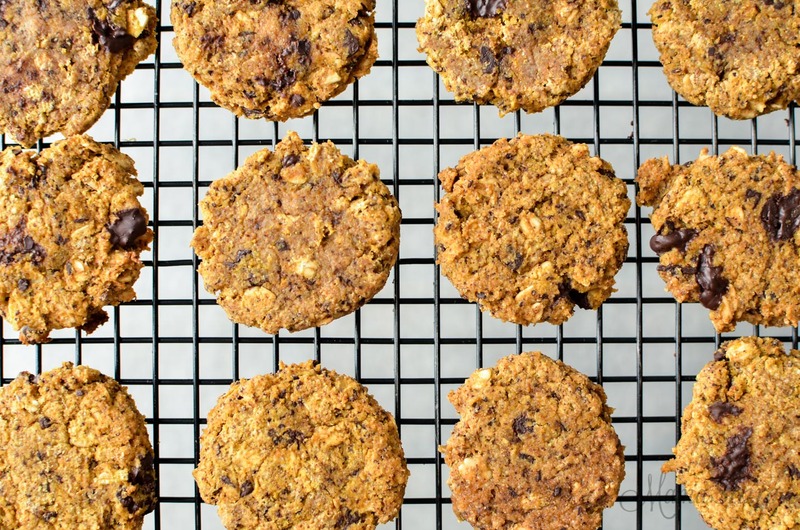 These pumpkin oatmeal chocolate chunk cookies are delightful little treats with a crunchy outside and a chewy inside. 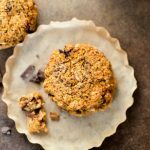 They make me think of a cross between an oatmeal cookie and those pumpkin treats that you can buy that have the little faces on them, but a healthier version with the added bonus of being gluten-free, dairy-free, sugar-free, and egg-free. 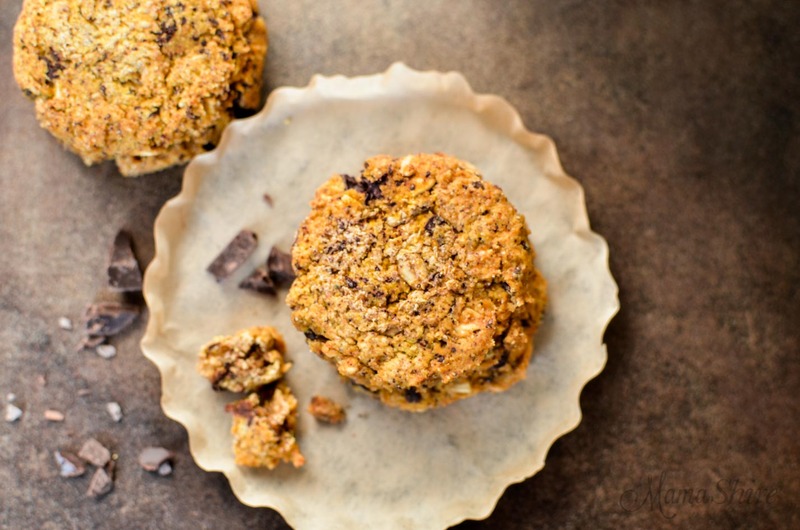 My daughter and I both thought these would be yummy for an afternoon snack with coffee or tea or to serve them alongside of a lean protein for a flavorful breakfast. I like to keep some Lindt 85% Cocoa Chocolate bar already chopped and stored in a jar so I can quickly add it to recipes like these cookies. 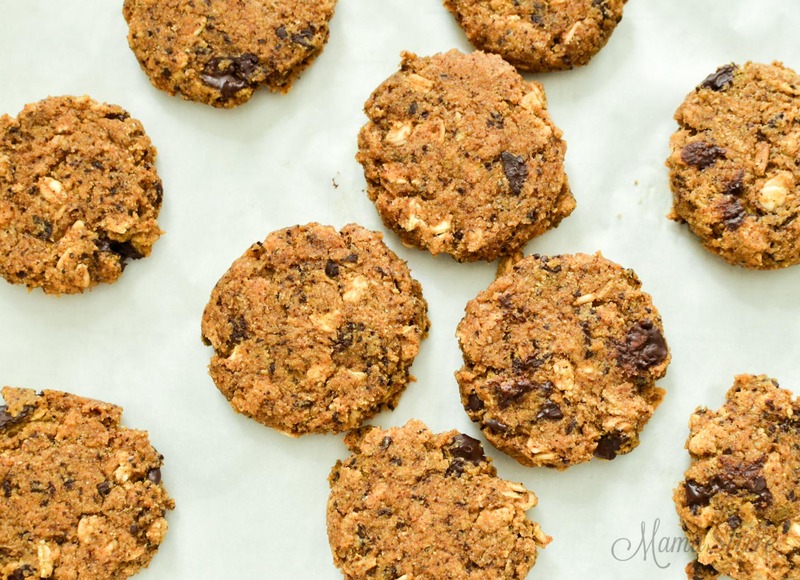 Trim Healthy Mamas these cookies are a Crossover. If you don’t have a sprouted gluten-free baking blend than you should be able to substitute with the THM Baking Blend. I haven’t tried it so you may need to tweak the liquid ingredients, as I think the THM Baking Blend is a thirstier flour. You can use this sweetener chart to make adjustments if using a different type of sweetener. Stir together the flour blend, oats, sweetener, cinnamon, baking soda, sea salt in a medium bowl. Whisk the pumpkin, applesauce, flaxmeal, and vanilla in a small mixing bowl. Add the pumpkin mixture to the dry mix and combine. Drop by rounded tablespoons onto lined baking sheet. Press down on tops of cookie to flatten. * You can use sprouted oats or non-sprouted, just be sure they are gluten-free. I have been wanting to try that sprouted gluten-free flour mix. I’m excited to find a recipe with someone who has used it! Have you tried it in any other E recipes?? 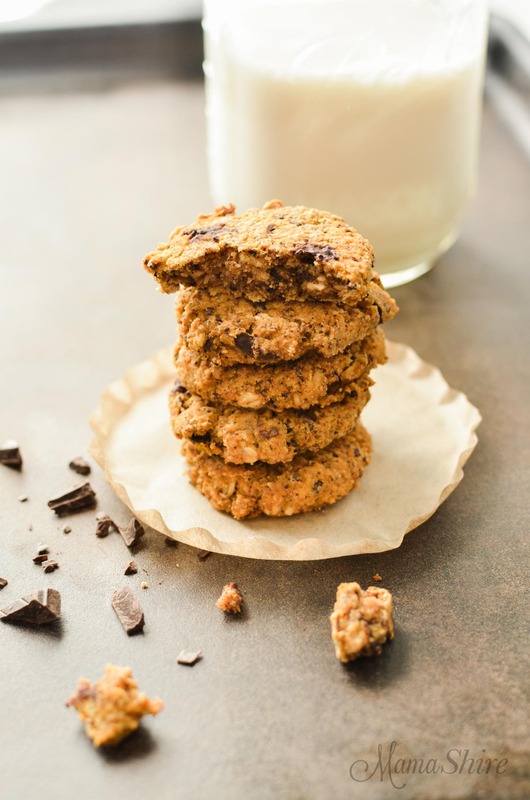 Just got my sprouted flour and making these cookies today–they sound so yummy! Oh, fun! I think you will like baking with sprouted flour. You’ll have to let me know what you think. Thank you! I don’t have the carb/fat count on these. I will do that soon and let you know. 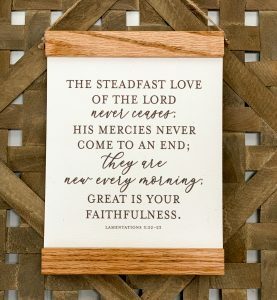 I plan to make these soon! They look like they would fall into the “E” category; I would just have to figure out how many carbs each cookie has. They sure look good!